Soul Serenade: The Intruders, "Together"
The Intruders were one of the most important groups in soul music history. My friends in Philadelphia — at the risk of catching a snowball in the face like Santa Claus himself infamously did at Franklin Field in 1968, we have to face the fact that the Phils didn’t have a very good season this year. And the Eagles, well they’re not exactly setting the gridiron on fire so far. But hey, there’s always next year, and even though your sports teams may come up short, your fair city will always be home to some of the greatest soul music ever made. When the talk turns to great Philly Soul, it’s impossible not to include the Intruders in the discussion. Their importance was incalculable for the local scene, and for music in general, because when the legendary producing team of Kenny Gamble and Leon Huff left Cameo-Parkway to go out on their own, it was the Intruders that they staked everything on. Fortunately, the group proved the wisdom of that decision. The Intruders, Sam “Little Sonny” Brown, Eugene “Bird” Daughtry, Phillip “Phil” Terry and Robert “Big Sonny” Edwards, began their recording career in 1961. They were pure Philly Soul, neither as pop-oriented as the Motown groups of the day, or as funky and gritty as the Stax/Volt lineup. The group recorded one-off singles for Gowen, Music Voice, Musicor, and Excel, before landing at Gamble Records in 1966. It was there that they had their first big success with “(We’ll Be) United” that same year. The record went top 20 on the R&B chart. 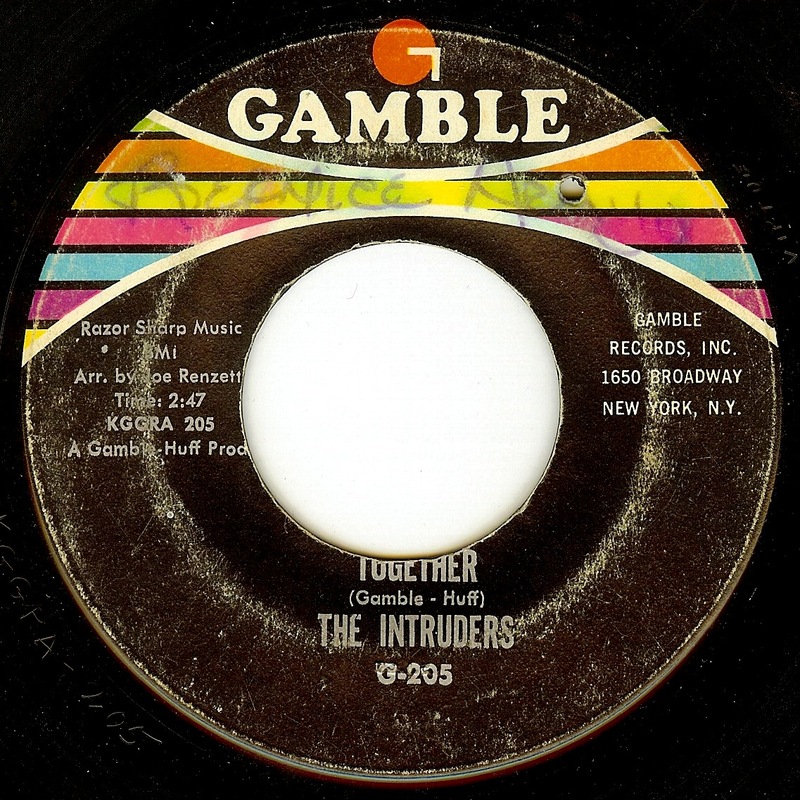 One year later the Intruders were back on the charts with “Together”, which was included on their first album, The Intruders Are Together. The single not only scored an R&B hit at #9, it also crossed over to the Hot 100 in a big way, reaching #48. Their biggest success however would happen the following year, in 1968. “Cowboys To Girls” secured a permanent place in soul music history for the Intruders. It was their only #1 R&B hit, and made it all the way to #6 on the Pop chart, selling a million copies and winning the group a gold record. The follow up single, “(Love Is Like A) Baseball Game,” was another chart success, and “When We Get Married” did well in 1970. The Intruders would have one last hurrah on the upper reaches of the charts in 1973. It was that year that they released “I’ll Always Love My Mama (Part One),” and the song raced up the R&B chart to peak at #6. The single also provided the group with another Top 40 Pop hit. Kenny Gamble’s mother Ruby, who was the inspiration for the song, died earlier this year at age 96. The Intruders would continue to record for another 12 years, but never again found chart success. It was the success of the Intruders that convinced Columbia Records to fund the startup of Philadelphia International Records for Gamble and Huff. That alone assures that the Intruders will always occupy a secure place in the history of soul music. Gamble and Huff themselves have acknowledged that it was their work with the Intruders that formed the basis of what became known as the Sound of Philadelphia. As you can see, the importance of this group cannot be underestimated. So remember Philadelphia, there’s another World Series and another Super Bowl every year, but great soul music lasts forever. That’s something they can never take away from you. For more on the assault on Santa click here.